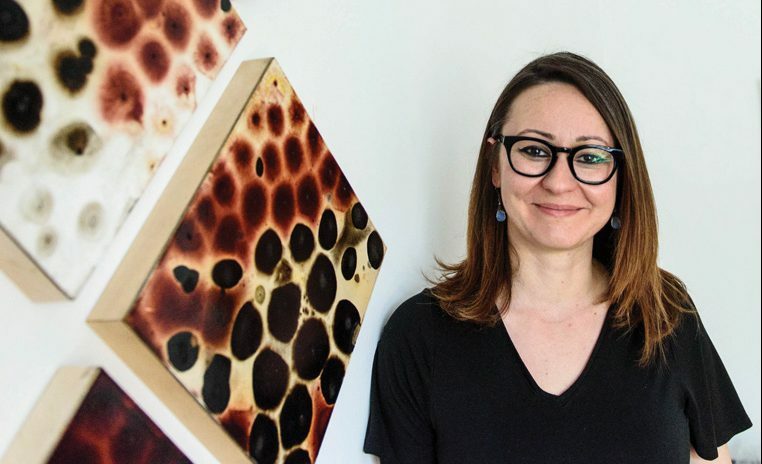 Drawn to science and nature, Balci earned her first degree in forest engineering at the University of Istanbul. After moving to the United States, she found work in microbiology laboratories but felt confined by the windowless, alcohol-scented environment. 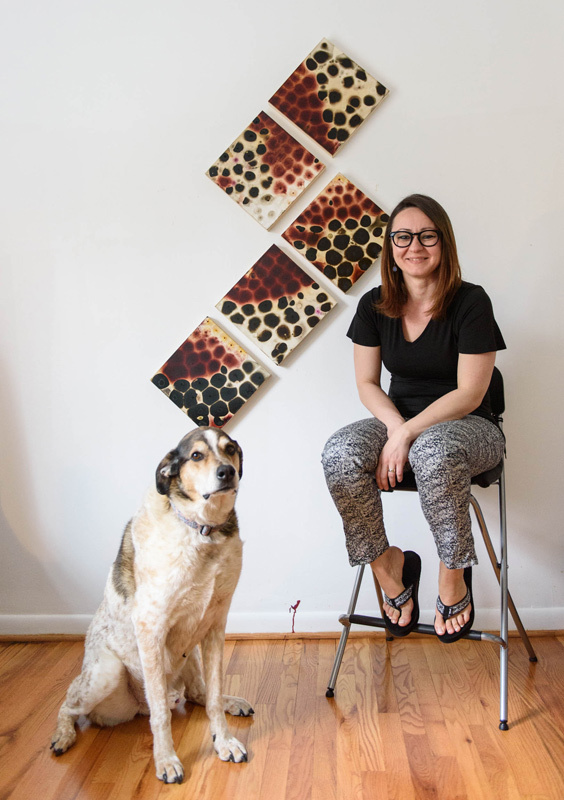 While living in Morgantown, Balci began studying photography at West Virginia University, where she earned a Bachelor of Fine Arts in intermedia studies. When the couple moved to College Park, Balci worked at the Smithsonian Institution’s photography center at the American History Museum. Not artistically satisfied with her portraiture assignments, she enrolled at the University of Maryland, earning her Master of Fine Arts in 2012. 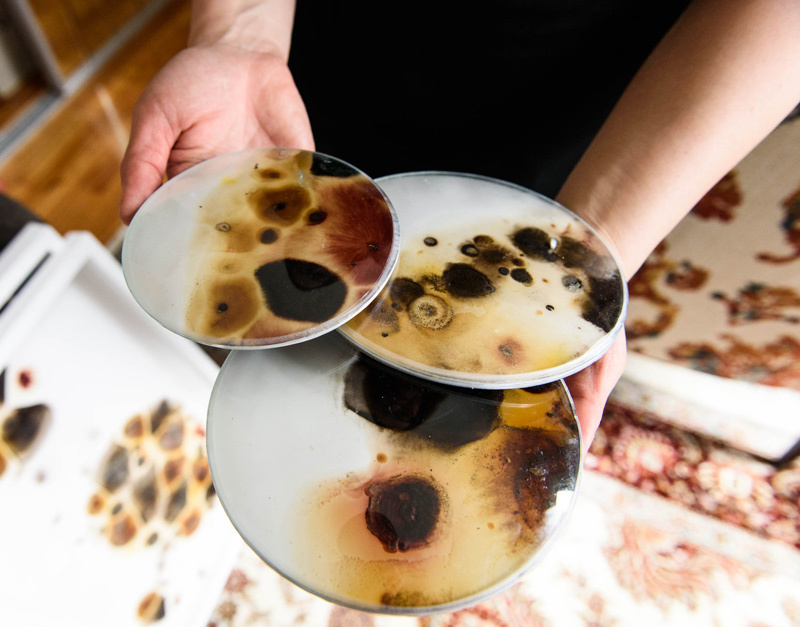 Working with microbial organisms, a medium with which her professors had no experience, Balci experimented until she was able to meld her scientific experience with her artistic vision. 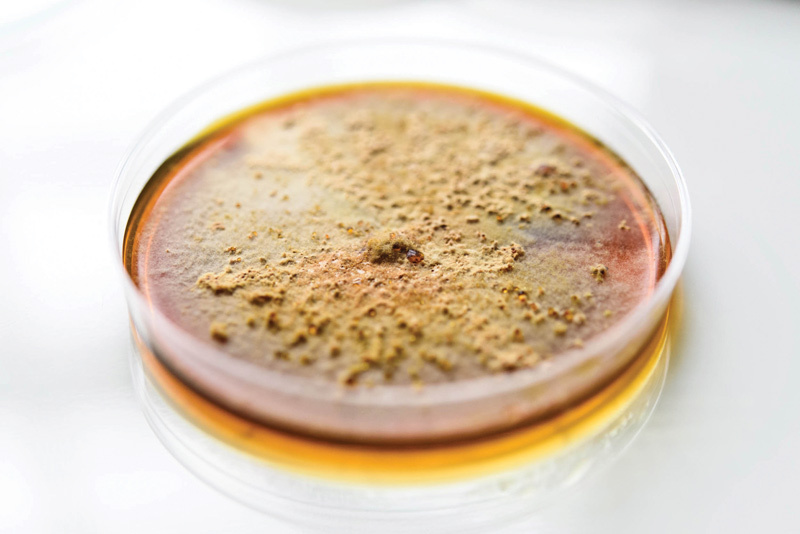 Using the growth medium potato dextrose agar (PDA), she grew samples of mold in petri dishes, and those became her lush, earthy palette. 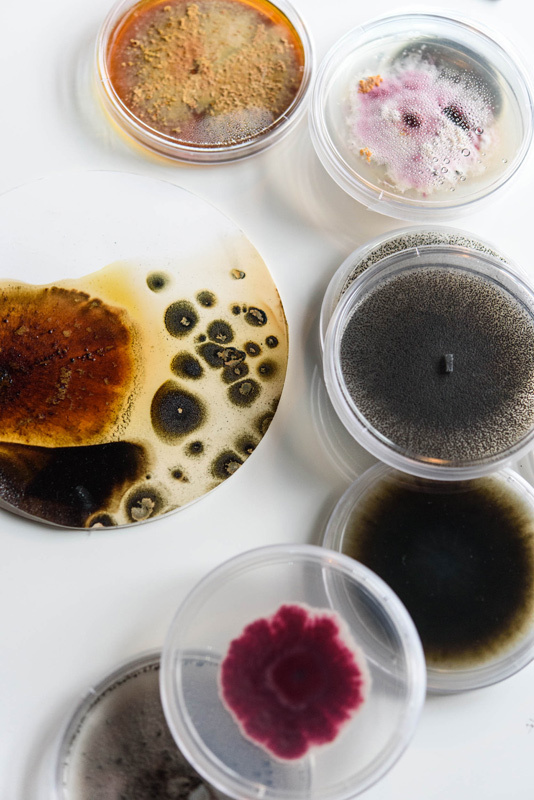 She applied small samples of mold to PDA-coated panels and YUPO® synthetic paper and nurtured them into works of art, selecting different molds for their translucency or opacity, color, and growth habit. 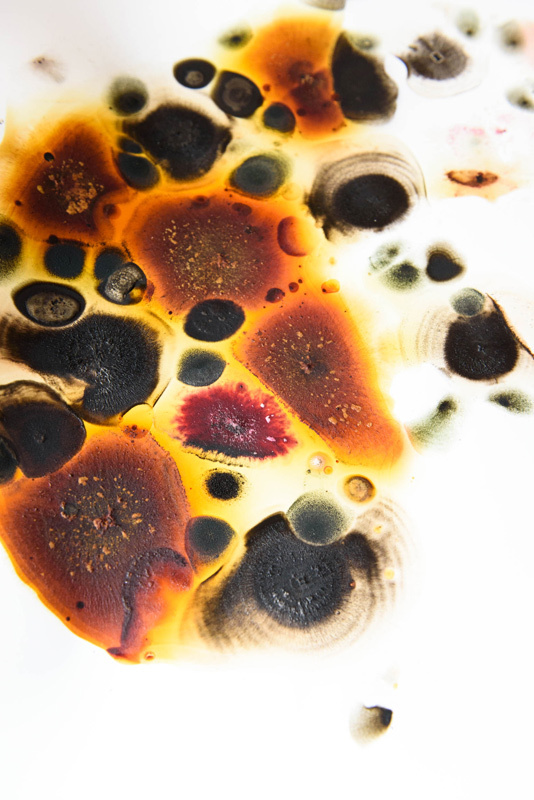 She learned to gently coax the PDA and the microorganisms into doing her bidding, creating mysteriously luminous works that seem both photographic and painterly. As she continued innovating with her unusual medium, Balci quickly became active in the art world, winning highly respected awards, grants, and fellowships and finding herself in the heart of some of Washington DC’s and New York City’s most progressive galleries. 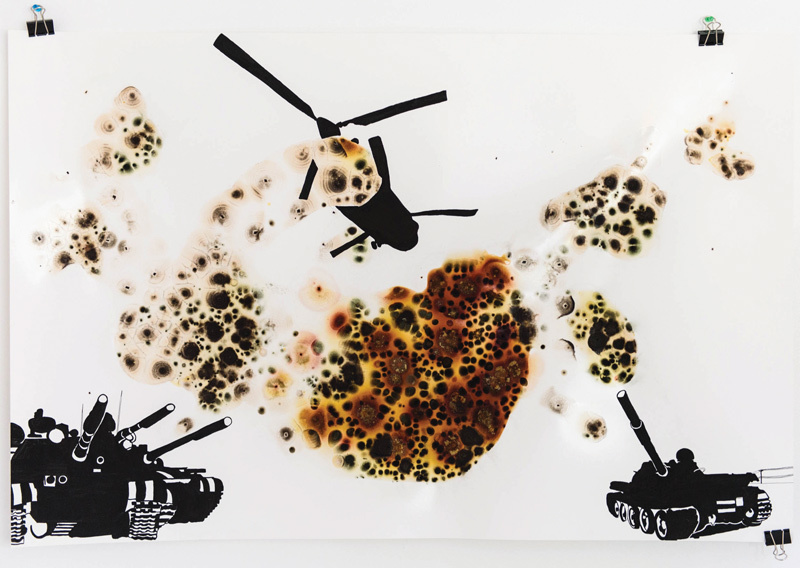 Balci’s work is categorized as BioArt, a loosely defined genre whose forms vary greatly from artist to artist. For Balci, BioArt both contains and creates a living thing. The microorganisms’ growth process serves as a microcosmic metaphor for humans interacting with each other, other creatures, and the environment. Like mold, we multiply and expand, fight over and consume limited resources, construct borders around ourselves, and eventually perish. In Balci’s pieces, the organisms consume their environment to its—and their own—death. When they die, they desiccate, and the artist seals them with acrylic spray to arrest any future growth. 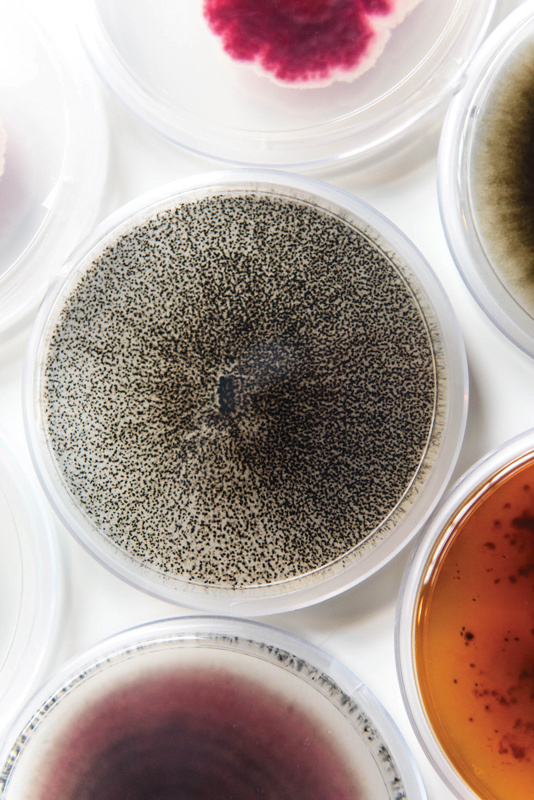 “Mold has no brain,” explains Balci, “it is just growing and trying to survive. We think we are conscious . . . but look what we are doing to our world—we do the same thing. Isn’t it funny?” One of her mold pieces can take months to complete, as she lets the life cycle run its course. 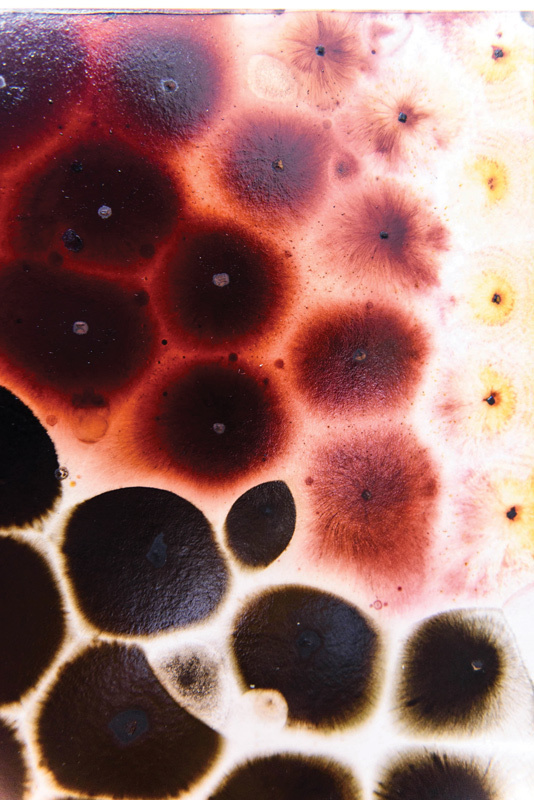 Though she works with organisms that go undetected by the naked eye, some of Balci’s creations are expansive. She’s intrigued by the idea of the invisible made visible, and has chosen to present it on a large scale. 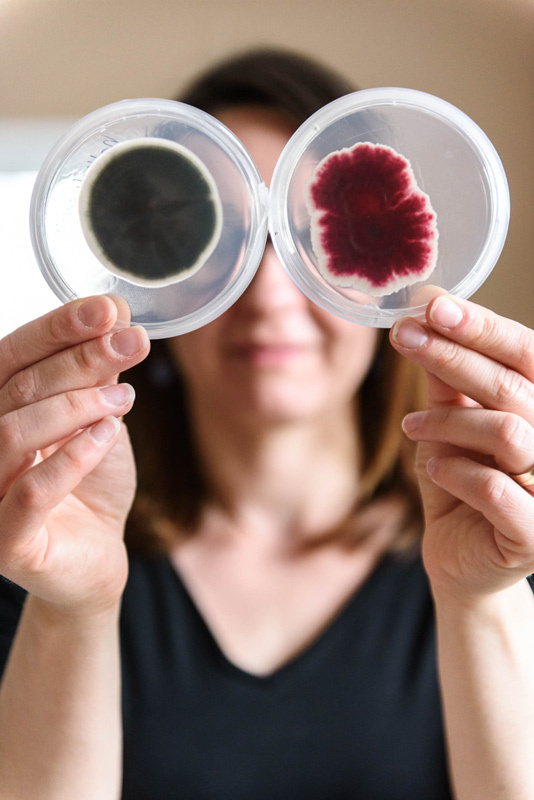 While most of her mold samples come from her own back yard, her concepts are global. Her installation Bordered World, exhibited in the cavernous space at Smack Mellon Gallery in Brooklyn, New York, took Balci and five assistants three days to install. 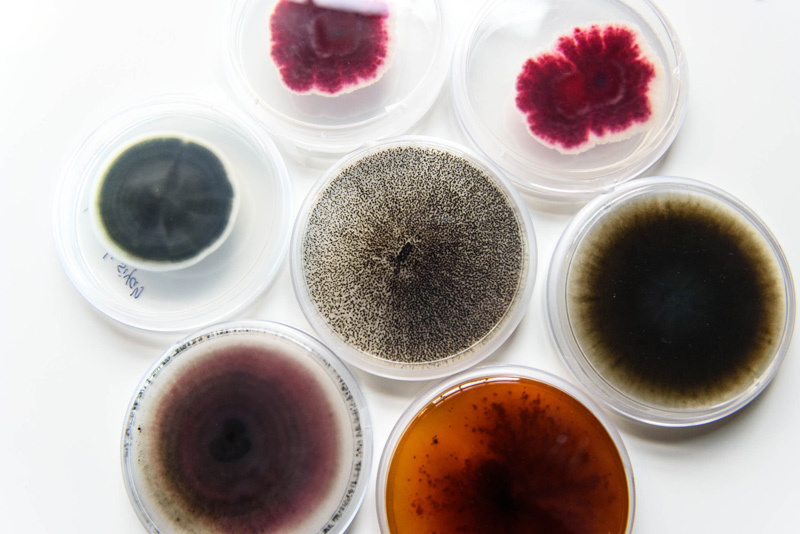 In the piece, 2,500 petri dishes of varying sizes feature bold red and black mold growing side by side. Each container is mounted on the wall to depict a map of the world. The piece spans three walls, with the petri dishes contoured into two corners of the room. 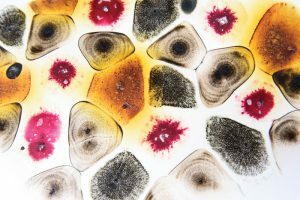 She also creates a big visual impact through her time-lapse video works, which show, in accelerated time, the organisms’ life cycles. 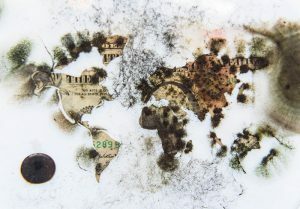 A recent work presents mold and bacteria growing on a small paper cutout map of the world, softly illuminated from behind; the finished video was recently shown as a large projection in an exhibit at the Buyukdere35 Gallery in Istanbul. 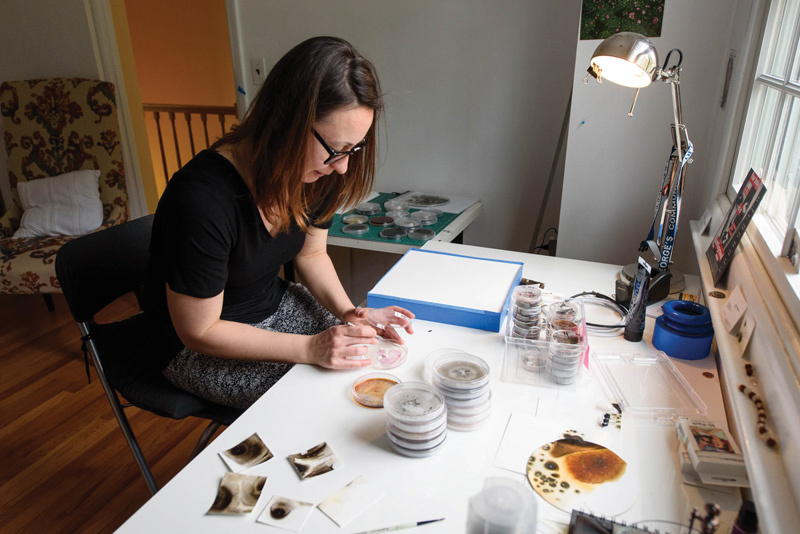 Balci doesn’t shy away from weighty topics, but she is energetically upbeat, punctuating her conversation with exuberant laughter—especially when talking about the challenges of working in her home studio rather than a laboratory. She must protect her carefully curated palette of organisms from airborne contamination. Holding up a can of Lysol®, she laughs, “You know what? You can trust this thing!” She sprays her studio down every other week, but foreign microbes will occasionally settle and feed on her pieces. 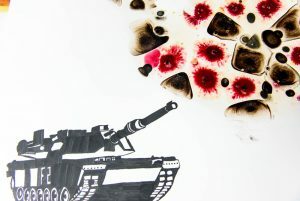 She points to dark spots on one of her recent war-themed works on YUPO® paper—a combination of gouache paintings of tanks, guns, and soldiers with mold, whose explosions of color mimic the smoke and fire. 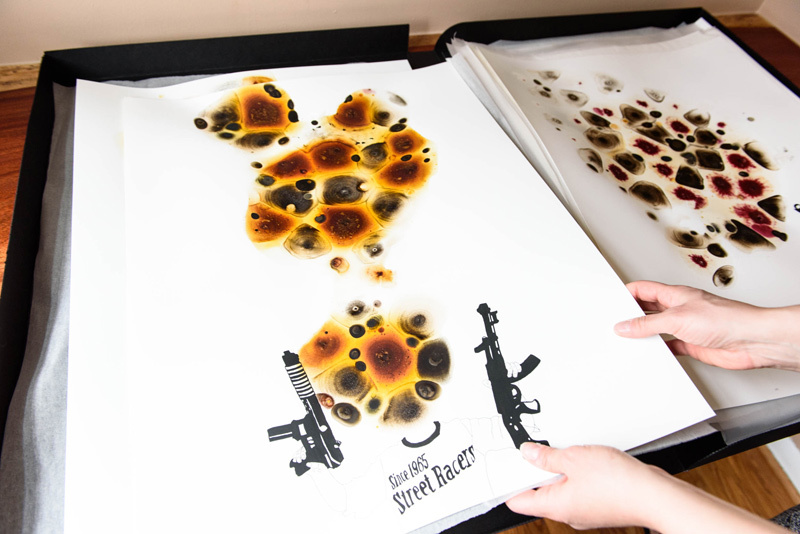 “Sometimes [the contamination] works—these little tiny dots, they look like coffee. But they are all contamination. This is my favorite—see the pinkish stuff? That’s contamination.” She has clearly embraced the unpredictability of working with living organisms. Between working in her home studio, giving artist talks, and teaching photography at Washington College, Anne Arundel Community College, and Prince George’s Community College, Balci doesn’t have time for much else besides the organic garden she and her husband keep. Their garden represents an effort toward sustainable living. 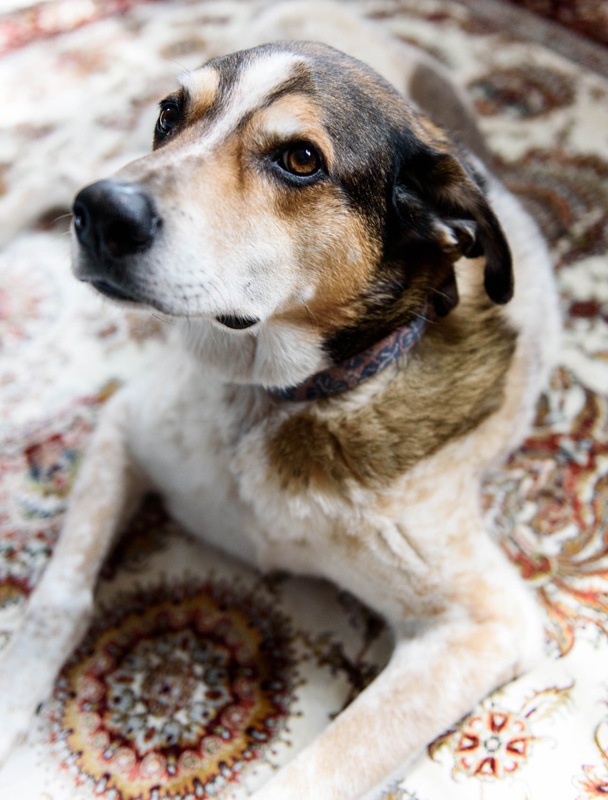 She is concerned about the current state of environmental policy. “My next work will be about pollution,” says Balci. She points to a white camera that looks like a toy, with its rainbow stripe. “This is a Polaroid camera,” she explains. “They’re so cute!” But there’s a serious message in her choice of equipment: “[The instant photograph] is so temporary,” she says, “and life goes so fast.” She plans to use her photographs of local waterways with YUPO® paper, growth medium, and mold cultures, and hopes the series will inspire people to act to support a clean environment. Error: Error validating access token: Session has expired on Saturday, 09-Mar-19 15:57:50 PST. The current time is Wednesday, 24-Apr-19 07:22:38 PDT.